What are you doing the evening of April 27? Looking for laughter and critical thinking? A show of comedy, reason, and alcohol. FUNNY YOU SHOULD THINK THAT is a monthly event (intelligently) designed to make you laugh and think. Moutons No More takes to the stage with amazing guests to talk pseudoscience, lambast religion, and get you to think more critically. It’s like the Rolls Royce of Skeptics in the Pub and just what Montreal need. Come for the show; stay for the conversation. This month features the production team of Moutons No More and Toronto-based stand-up comedian JP the Apostate! April 27, 19:30, M-Bar near Berri-UQAM at 1245, rue Saint-André. Moutons No More will see you there! * On Facebook, search for “Funny You Should Think That” and you will find the event. * On Meetup, go to http://www.meetup.com/Moutons-No-More/ and RSVP for the event. You can also check out http://www.m-montreal.com, the website of the bar where the event is happening, which will be announcing the event this week. 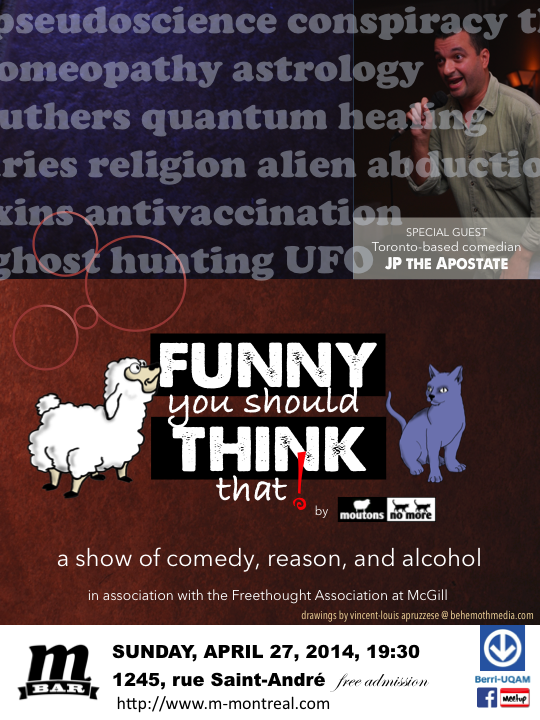 Tags: critical thinking, funny you should think that, McGill, moutons no more. Bookmark the permalink.